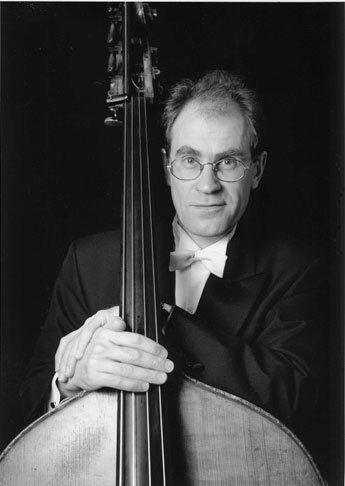 Jan Alm, currently Assistant Principle doublebass with the Gothenburg Symphony Orchestra (GSO), completed his studies in doublebass at the Hochschule der Künste in Berlin and joined the GSO in 1984. In addition to touring and recording with the orchestra, Mr. Alm often gives pre-concert lectures to help audiences develop their understanding and appreciation for symphonic music and also arranges music for the Göteborg Konserthuset's Children's Concert Series. Mr. Alm has composed two works for doublebass, Quartet for Doublebass No.1 [Gehrmans, Stockholm], recorded by the Frankfurter Kontrabass Quartett and the Bottesini Doublebass Quartet, and Quartet for Doublebass No. 2 [Almusik, Göteborg] which won best composition by the International Society of Bassists, Indianapolis in 2001. His most recent composition for bass is titled Trandans (Dance of Cranes) scored for electric bass and orchestra. This piece had its premier at the Gothenburg Konserthus and was performed by Magnus Rosen (former the bassist for Hammarfall), and the Gothenburg Symphony Orchestra. He has also composed Martinson Songs for solo voice, piano, harp and string quartet set to the poems of Harry Martinson. The songs were performed by The Martinson Project and presented by the GSO's chamber music society "Fika Stråket" as well as the Göteborg Konserthuset's chamber music series. In 2004, the songs had their premier in Poland at Poland's National Philharmonic in a program titled Scandinaviana, the inaugural concert for the Philharmonic's newly renovated chamber hall. In collaboration with American soprano Amy Elizabeth Wheeler, he translated and performed the Swedish version of Jon Deak's adaptation of The Ugly Duckling for soprano, doublebass and string quartet, presented by the Göteborg Konserthuset's Children's Concert Series as well as the Bohus Operan's Summer Festival and the Backa Theater. Mr. Alm has coached and taught doublebass at the Royal College of Music in London, and is also active with the bass sections in youth orchestras in England and Göteborg. In 1987, Mr. Alm became a member of the teaching staff at Göteborg's Musikhögskolan (Artisten).